Happy Thursday everyone! The kids are back in school after last week's spring break, and I'm looking forward to celebrating my birthday tomorrow with my family. I'm turning the big four-five this year -yikes! Last week I took a small step outside of my comfort zone and tried something new-- this leather handle tote bag! 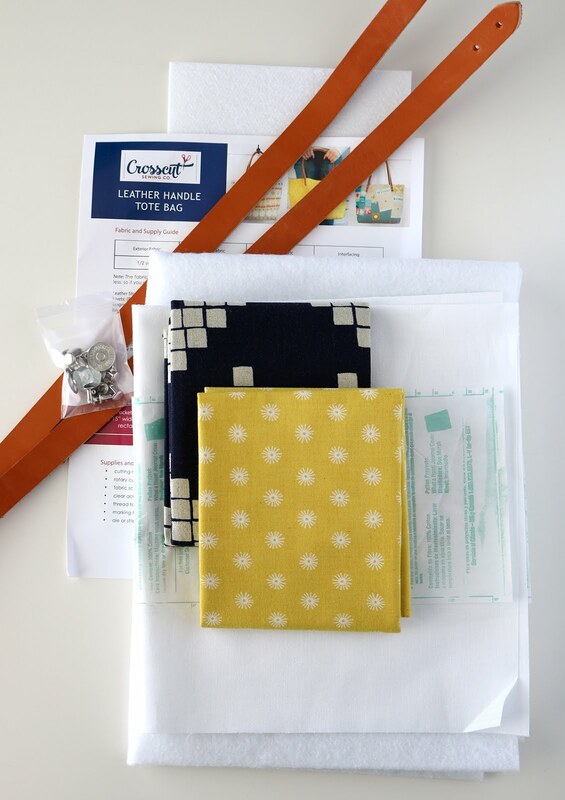 I got everything for the bag from Crosscut Sewing Co. They sell a handy kit that has the straps, hardware, Peltex bag bottom and even the pattern! You can use your own fabrics and interfacing or chose and purchase some from their shop and everything will be shipped together. Shop their fabrics here, and their interfacing here. The pattern - which is full color, with easy to follow photos and instructions - showed me how to install this magnetic snap, as well as the leather handles with rivets. Can I just tell you how intimidated I was by those leather handles? Silly, I know. When I attached the handles with the rivets I didn't need any special tools - just a hammer! Crosscut Sewing Co also sells kits with black handles here. 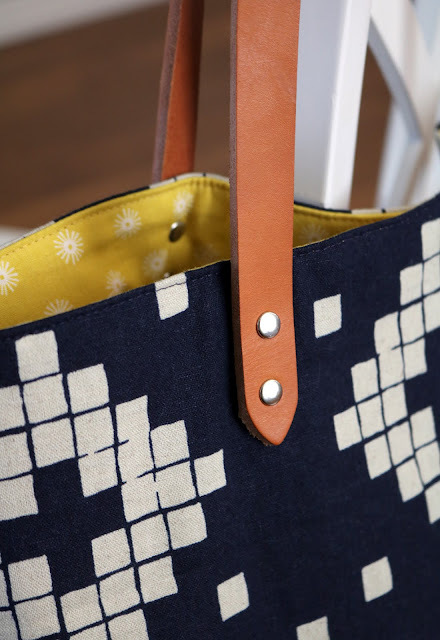 I chose a canvas print from Cotton + Steel for the outside of my bag, and I like the weight and structure that it provides. You can see their other canvas prints here. 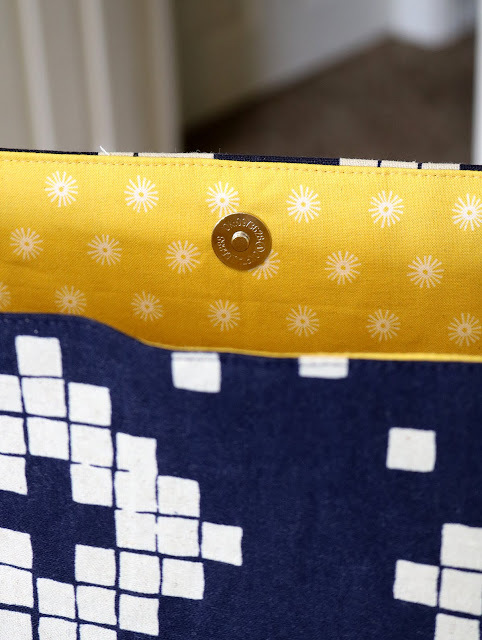 For the bag lining I chose this sunshine yellow print also from C+S. I love the contrast between the navy and yellow! This was a fun project that I finished up in an afternoon. And now I'm wanting to add leather handles to everything! 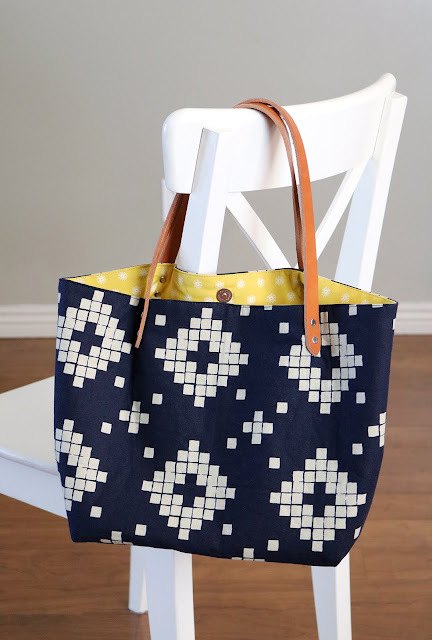 You can find the bag kit here, and Crosscut Sewing Co also has a blog. Have a great weekend, and I'll be back on Sunday with this month's Second Look Sunday post! What a great looking bag! Love your fabric picks and the handles. Can I ask you what size the bag is? Your bag looks awesome! With a capital A! I’d be pretty intimidated by those handles. Happy Birthday to you! Wish I was 45 again! The years pass so quickly.